The German Agent who planned the bridge destruction at Vanceboro in the First Great War is captured. Franz Von Pappen caught in Ruhr area as allies advance. Maine town finds grim satisfaction in plight of former German Chancelor. N.B. in the York County Court of New Brunswick. He was sentenced to five years in the Dorchester penitentiary from which he was released for deportation before completion of his term after the war's end. certain persons to destroy the Vanceboro Bridge. Later publication of Von Pappen's secret documents disclosed payment of $700 by Von Pappen to Horn. A few weeks before the attempt was made on December 1914, Horn left Boston on the midnight train with a suitcase filled with dynamite which he placed under his lower berth in a pullman. Unknown to him, he was already under observation. He was seen hiding the suitcase in a woodpile near a siding at Vanceboro while he inspected the bridge. He then recovered the explosives and took a room at the Exchange Hotel where he remained until the night of December 31 when he gave up his room and set out upon his task. Crossing the bridge to the Canadian side with his dynamite, he narrowly escaped death twice from passing trains in the bitter 30degree F below temperature and 80-mile gale. The dynamite was placed against a girder and a shortened fuse touched off with a lighted cilrar. So bitter was the weather that Horn returned to the Hotel for shelter after his ears, nose, hands, and feet had been frozen. Machias at the County's expense for the next 30 days after pleading guilty. fact the railway bridge was Canadian Property. About the time of the Vanceboro Bridge incident, the Providence journal started exposing the treacherous activities of the German Embassey Staff in the United States. Some of this information is believed to have been made available to the newspaper by British Secret Agents not in a position to disclose it to the then neutral United States. Among the documents published in this connection were some stolen from Dr. Albert, Financial Advisor to the German Embassy; Von Pappen himself in a communication to his wife, which was later seized and published, attributed the feat to British agents. It was the result of this published evidence that the United States finally demanded that Von Pappen be recalled by his Government. His recall was announced 10 days later, but secret agents were still on the trail of Von Pappen's jealously guarded documents. It was found desirable that the container in which the papers be transported back to Germany should be marked in such a way that they could be seized easily when Von Pappen passed through the British Blockage. A stenographer who had been planted in the office of the Austrian Consulate General in New York helped pack this box and was sitting upon it when Von Pappen strolled in to say, "Farewell." This girl shared her lunch with him, still sitting upon the box. While Von Pappen flirted with her, she idly drew two red hearts on the outside of the box with a crayon. Von Pappen seized the crayon and completed the sketch with an arrow piercing both hearts. This was the marking that the British Naval control at Falmouth looked for. When Von Pappen's papers were taken from him enroute back to Germany, subsequent publications of their contents did much to disclose the full ramifications of German sabotage and espionage in the United States. On December 19, 1943, four RCAF men from Pennfield were killed instantly Sunday when a twin-engine bomber crashed a quarter of a mile from the railway station here. The aircraft had been flying in formation with two others over McAdam. Railway Employees saw something fall from the plane when it collided with a 20-foot indicator above an 80-foot water tank. Flames shot from the plane when it struck the indicator, a few seconds later a heavy explosion occurred apparently from the bomber's gas tanks. The flame-enveloped plane crashed on a knoll, side swiped a house occupied by Mr. and Mrs. Charles Webber and seven children. After breaking a window and ripping off a back porch, it turned over several times while cutting a broad swath 300 feet long through snow, ice, and bushes. The explosion blew the bomber to bits over a large area. Bodies of the three occupants were hurled a considerable distance from the crash scene, the fourth was found in the wreckage after the McAdam Fire Department extinguished the flames with water pumped from a locomotive. The nose of the engine was found three hundred yards from where the crash occurred. reigned supreme among those imbibing, the temptation proved too strong and soon all were enjoying their bonanza. Police soon learned of the leak and upon investigating, found that a 40-gallon keg of rye had somehow sprung a leak. It is understood the'liquor was part of a shipment bound for Ontario. Due to lack of snow and continued cold weather, the Canadian Pacific Railway and residents of the Village were facing a very serious situation from the shortage of water. The pond adjacent to the station, which supplies the round house and railway shops, had practically run dry. As a result, the Canadian Pacific Railway was forced to use its emergency pumping system to force water through a pipeline from Wauklehegan Lake, three-quarters of a mile from the town. This 6-inch pipe runs through the woods, swamps, pastures, and under the town roads before entering the pond. Owing to the rocky formation of the land in this section of the country, the greater portion of this pipe is above ground and exposed to the weather. With the average fall of snow each year, this line is usually protected; but the lack of snow had left the line at the mercy of the elements, so disaster struck at the pipeline. Just when it was needed most, it froze. The frost and ice cracked about 1,500 feet of pipe and the rest was frozen solid. A crew of about sixty men, including reinforcements rushed from Saint John and Brownville, worked day and night in an effort to replace the broken pipe and thaw out the remainder. Fires were built at different sections and steam from an upright boiler was used. Four days and nights of endeavour rewarded the workers. Some of the pipe was reclaimed by welding. Persons who understood railroading, and there are very few who don't in this railway town, knew the seriousness of the situation at this time. Passenger and freight trains must be kept moving and there must be no delay. War-time conditions added to the urgency of shipping and travel. The tank of each engine leaving the junction must be filled to capacit with between 5,000 and 10,000 gallons of water. There are between fifty and sixty such engines leaving here every 24 hours. In addition, a tremendous amount of water is used for washing out locomotives, boilers, power house, shop, and round house. Railway men believe had it been impossible to complete repairs to the pipeline in such a short time; a critical situation would have developed at this point, and this might have delayed important shipments. The pump house at the lake which had been used in emergencies was discontinued with the arrival of the diesel engines, since their need for water is much less. 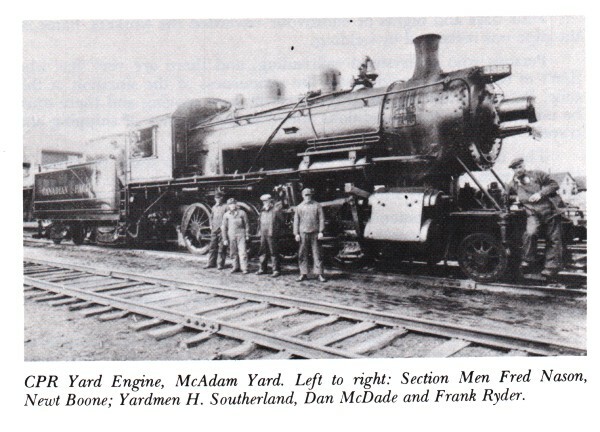 photo - CPR Yard Engine, McAdam Yard. Left to Right: Section Men Fred Nason, Newt Boone; Yardmen H. Southerland, Dan McDade and Frank Ryder. On March 8, 1945, G3 Locomotives replaced four engines formerly used. A new type of Locomotive which replaced four of the kind formerly used made its first run today on the C.P.R. Line between here and Montreal. Two of the Locomotives, No. 2413 and 2453, which are the G3 type, built by the Kingston Locomotive Works, hauled both Montreal trains No. 40 and No. 42 to McAdam and No. 39 and No. 41 from McAdam to Montreal without a change of engine; whereas, previously, a change was required at each divisional point. of coal and 12,000 gallons of water. The stalls at the McAdam round house are being enlarged to accommodate the new locomotives. The dieselization and centralization program of the Canadian Pacific Railway during the 1950's resulted in McAdam losing much of its importance to Railway Operations. McAdam had come into existence because of its location and the nature of the steam engine which had to be serviced every 100 to 150 miles. McAdam was located about this distance from Saint John and the junction point with North and South lines. All traffic moving over the line, destined to the Eastern Terminal and Winter Port for the Canadian Pacific Railway, passed through McAdam. With the Railway Shops located at this point, all rolling stock from the locomotive to all types of cars could be repaired. All trains were inspected for defects to equipment, and any defects found would be repaired here. The men who were responsible for keeping the outside of the engine clean by preventing the build-up of grease and dirt were known as "Engine Cleaners." "Ash Pit Men" were responsible for cleaning the fire and cleaning the ash pits in the Round House. The men who lit up the fire after the ash pit men had cleaned out the fire box and kept the fire going until required were known as "Bank Firemen." The men who filled the grease cups with grease on the driving rods, air pumps, etc., and who put the necessary supplies on the engine for use enroute, were called "Trimmers." There were "Blacksmiths and Blacksmiths' Helpers" who did welding, forging parts, etc. Repairs were made to the engine by "Fitters" and their helpers. "Boiler Makers" kept the boilers repaired. "Machinists" made many of the parts required in the Shops at McAdam. During peak periods approximately 150 men would be employed during the 24-hour period. During World War II, there were times when an engine an hour would be serviced during a 24-hour period. March, 1946 - Seven women complete war services with C.P.R. Evidence that pre-war conditions are slowly returning was seen at the Canadian Pacific Railway Shops, McAdam, on a recent Friday afternoon when seven women employees completed their war-time service with the Company and were replaced with male help. They were: Mrs. V. Ryder, Mrs. L. Quigley, and the Misses Alice Murray, Laura Miller, Ruby Burrell, Betty Speedy, and Agnes Bell. At five o'clock, employees of the Car Department and Ice Gang assembled in the Car Shop where Ralph Lord, on behalf of the employees, presented each woman with a suitable gift. In his remarks, Mr. Lord intimated that it was with a little resentment that he and his fellow workmen learned of women coming to invade their masculine domain. He added that they had done a good job, and keen regret was felt at their departure. The first C.P.R. Diesel Engines 8447 and 8448 arrived in McAdam, November 24, 1954, on extra East at 3:50 p.m.; Conductor, M. McDonald; Engineer, Hughey; Trainmen, Wright and Marsh, hauling 36 cars of grain, 2,973 tons. These two units working East on No. 68 with Conductor L. Phillips, Engineer Tippets, with 36 cars of grain and 4 cars of potatoes added at McAdam 3,203 tons. First trip of Budd Cars 9100 and 9102 arrived on No. 101 at 7:45 a.m. E.S.T. Engineer W. MacDonald, Conductor G. A. Brown, Trainman T. Currie, departed North No. 153 at 9:00 a.m. A.S.T. Engineer R. A. Sullivan, Conductor H. G. Leach, Trainman E. Bowmaster. On November 16, 1963, Trains No. 123 and No. 124 discontinued, the Budd Cars making their last trip with Conductor George Boone, Engineer W. Golding. August 16, 1958 - Last trip was made by the Gas Electric Car 9008 between McAdam and St. Stephen. The last steam engine operated out of McAdam was April 14, 1960, Train No. 52, Engine No. 986, Engineer, B. E. McGee (Bennie); Fireman, Doug Delaney; Conductor, George Anderson. Train No. 52 was discontinued April 24, 1960.
photo - Bomber Plane struck indicator on this tank, McAdam, N.B. November 6, 1960 - It was cold and overcast and there was a touch of snow in the air. Steam Locomotive 29 slowly edged its way out of the Round House at Glen Yard and made its way down to Windsor Station officially ending the steam era for Canadian Pacific. Engine 29 was built in 1887 at Canadian Pacific Delorimier Shops. It was the thirtieth locomotive built at the Company's Shops and was numbered 351. In 1905, in a general renumbering, it became 230, and assumed its present number of 29 at the beginning of World War I. About the year 1913, the locomotive was completely rebuilt, acquiring a superheated boiler and the original flat valves were replaced with piston valves. The engine was redesigned so that very little of it resembled the original locomotive. Locomotive 29 was one of three "A" Class 4-4-0 Engines which remained in service until the late 1950's on the Minto Subdivision in New Brunswick. Number 29 was given such "personal" care by its engine crew and Round House Staff; and it was in such excellent condition at its retirement, that the Canadian Pacific decided to save it from the scrapper's torch and donated it to a Museum located near Montreal. Today, it sits idle, its boiler empty - a skeleton from the romantic days of railroading. It set out on November 6, 1960, with the final destination being St. Lin., Quebec, where large crowds came to say "good bye" to the old iron horse of yesteryear. Then came the final burst of steam and with it the close of another chapter in Canadian Pacific, eighteen years ago. This piece was given to us by one of the retired shop staff who had worked on the 29 on many occasions at McAdam Shops. He had clipped it from the C. P. Rail News and placed it as a memento in his photograph album many years ago. The credit for writing this article goes to Stephen Morris, Correspondent for C P Rail News. The final run of the Canadian Pacific Railway's No. 123 and No. 124 was more than a passing legend. It was truly the end of an era November 16, 1963, when one of the last chapters was closed in the history of local passenger service in New Brunswick. For many little New Brunswick communities scattered along the Saint John River Valley, the last whistling of a 2-Unit Rail Diesel Car along the line between McAdam and Edmundston was a sad occasion. A group had gathered on the platform at McAdam Station to see the C.P.R. Budd Liner depart on the final run from McAdam to Edmundston that cold November Saturday. Conversation by the people at McAdam on this memorable day cast a somber mood among those present. This was the last of the branch line passenger trains. In the good old days there were passenger trains morning and evening to St. Stephen, St. Andrews, Woodstock, Edmundston, and Saint John. These connected with the Main Line Trains to Montreal and West, to Boston, and to Halifax. Many boarded the train for a last trip at McAdam and the Budd Liner departed North bound an hour late. There were some who just stood and watched wondering when other passenger services would disappear. Scenes like this were common all along the line. Many wanted to take a last ride on the train and at times the coach was full to standing room only and overflowed at times to the baggage car. On the return trip, it was much the same. People along the route who had become acquainted with the train crews were on hand to shake hands with the crew or wave "good bye" as the train left the stations. To the business community along the route, it was a time for wondering how they would manage. It had been possible to telephone an order to Montreal or Saint 'John in the- morning and receive it the next morning on the train by express. Many residents of the Village of McAdam were affected by Wednesday's storm, one of the worst winter rain storms in years which caused extensive flooding of buildings and consequent damage. Today things are gradually returning to normal as residents begin to assess their losses. Mayor H. Stanley Dixon said that in comparison to many other communities in the area, McAdam suffered a minimum of damage, possibly the greatest single loss was the bowling alleys which were flooded in the Asler Masonic Lodge. This is extremely regrettable since it is one of our more important recreation facilities. Ronald Swift W. M. of the lodge assessed damage at between eight and ten thousand dollars. He stated it was doubtful if the lodge could ever afford to replace the alleys. On the whole damages were minor. Other residents experienced anxiety and inconvenience by flooded basements, failure of heating systems, telephones, etc. It appeared little permanent damage was sustained. An unofficial spokesman for the C.P.R. here stated it would be another 10 days before the Atlantic Limited will be able to continue through to Saint John. The Atlantic Limited normally provides overnight train service between Montreal and Saint John but travel was disrupted Wednesday due to the loss of a bridge near Bailey and washouts along the track. In the meantime, passengers are being transported by bus between McAdam and Saint John. 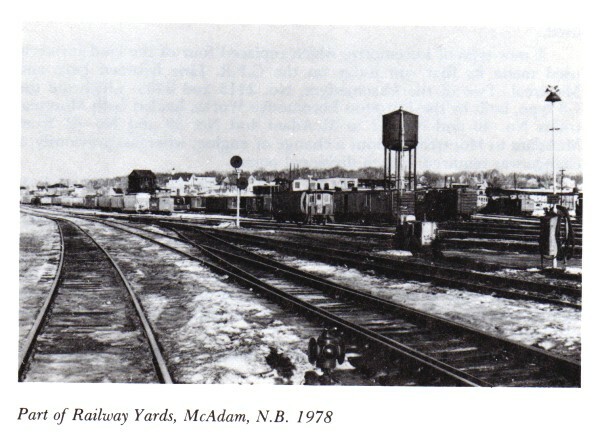 The train is held over at McAdam and returned to Montreal in the evening. Canadian Pacific Freight Service through McAdam is moving North via St. Leonard over the C.N.R. Railway. On December 21, 1975, a large section of the community's commercial district in the Southwestern New Brunswick Village was destroyed by fire Sunday, when flames raced along both sides of Main Street. Four families were left homeless as a result of the fire, but none was injured. The Little and Thorburn Clothing and Hardware Store; its two warehouses and buildings housing the T. Eaton Co. Ltd. Mail Order Office, Peter Forbes' Law Office, and the McAdam Ladies Aid Shop, were levelled in the worst fire in recent history of the Village. Fire also damaged Anderson's Furniture Store, the White House Restaurant, a Branch of The Bank of Nova Scotia, and the Baptist Church and Parsonage. Damage is estimated at a quarter of a million dollars. More than one hundred firemen and volunteers battled the blaze for almost seven hours in temperatures of 25' below on the Celsius scale. Firemen from nearby Harvey and Vanceboro, Maine, joined with the Village Fire Department and Canadian Pacific Rail equipment and crews in battling the blaze. The fire is believed to have started from an exploding oil stove in an apartment above the Clothing and Hardware Store occupied by Mr. and Mrs. Brian MacDougall. Mr. and Mrs. Willard MacKay, who occupied the other apartment, were forced to flee without any possessions. Two apartments above the furniture store were also damaged, forcing the occupants to the street. Firemen were able to salvage Christmas parcels in the T. Eaton Co. store but a large supply of toys and other merchandise in the basement was lost. Handicraft articles and used goods sold as a fund-raising project by the Hospital Ladies Aid were lost. Some merchandise was salvaged from the Anderson Furniture Store. Mayor Carroll, who was at the scene of the fire, said it was a miracle that the fire did not spread further. A spokesman for the Harvey Station Brigade said when the alarm was received about 3:30 a.m., firemen could see the flames from six miles away and we thought the whole town was going. Hydro and Telephone services were interrupted but later restored by crews from St. Stephen who arranged by-pass lines around the scene. For a time, the community was isolated but R.C.M.P. used their radio system to summons help from other Fire Departments. C.P.R. Auxiliary Crews normally stationed in the Village were late getting to the blaze since they were in Maine making repairs at a 10-car derailment. The High School students who helped man the hose line in the sub-freezing temperatures were a great assistance in conquering the blaze. The shop "whistle" calling men to work had always been a part of the life of each person and home in the community. It served as town clock, regulating meals, as well as working hours. Eight times a day the whistle could be heard, each with its own meaning. 7:oo a.m. - Wake up; 7:45 a.m. - Leave home; 7:57 a.m. - Ready for work; 8:00 a.m. - Work commenced; 12:00 - Noon Lunch; 12:47 - Ready for work; 1:00 p.m. - Work commenced; 5:00 p.m. - (Final Whistle) Work day over. The steam whistle also served the community in times of distress as a Fire Alarm, reporting persons lost, or to give notice of a wreck (this was four long blasts at ten-second intervals). The steam whistle could be heard approximately ten miles. With the closing of the shop, the whistle no longer sounds. A siren was erected to notify the community of fire. That, too, was lost in the fire of 1977 which destroyed the C.P.R. Shops. Then the community had to rely on the sounding of the locomotive whistles which used a series of short blasts as a firm alarm. A new alarm was put in use in 1978. This alarm was placed on the new Fire Station on Saunders Road in the centre of the Village. In 1913 the Police Court business of McAdam that had hitherto been done in Fredericton, is now to be done at home. Permission to maintain a lock-up and a Police Officer having been granted at the recent session of the York County Council, J. B. Hawthorne lately Chief of Police at Fredericton has accepted the Policeman's position at McAdam. Traditionally McAdam had a local Policeman who was appointed and paid by local taxation. The new legislation, January, 1967, "Equal Opportunity" created an option for each Village whereby it could continue its own Police or use the services of the R.C.M.P. Highway Patrol and enforcement of Federal Legislation. On January 30, 1967, a meeting was held to decide on a change from local policemen to R.C.M.P. When it was found that the R.C.M.P. would only patrol the main street and had duties patrolling highways and other towns, no decision was reached and another meeting was called for the following week when it was decided to keep the local Policeman. May 31, 1974, Royal Canadian Mounted Police take over policing of the Village. The new policing regulation went into effect at midnight Friday. The McAdam Detachment will consist of five members, three of whom will be assigned to the Village proper and two to rural areas. There are several small cemeteries in the vicinity of McAdam. There is one at Clark Dam between Third and Fifth Lakes. A group of boys were going fishing and decided that they would get an early start so left home late in the evening with their camp equipment and food. They planned on spending the night between the lakes in an old camp formerly used by the stream drivers. They arrived at the camp, had a lunch, and were preparing for the night when one of them decided to make up one of the top bunks. When he reached into the bunk he felt something unusual and called for one of the other boys to pass him the lantern. On inspection, they found the body of a man in the bunk. Over the years, this grave was kept up by the stream drivers and later by some of the staff of the Eastern pulpwood co. but the head board has fallen into decay. No one seems to care any more, and no one seems to know who the man was. Another grave is located near where the LaKing farm was located (now owned by Holly Lister) on the old stagecoach road from Oak Bay to Woodstock. The legend has it that the stagecoach used to stop at the "Coconut Spring" (so named because a coconut shell was used to dip water from the spring for drinking). This spring was located near the Allen Farm. On this occasion the stagecoach stopped as usual to allow the passengers the opportunity of having a good cool drink of water, and as they approached the spring they found the body of a man who had been murdered. The body was taken back to a high ridge and buried near an old gravel pit. No marker shows the place. There is a lonely little cemetery, probably the smallest on record, at the 4-mile curve on the Canadian Pacific Railway between McAdam and Vanceboro. It is not known just when it was established, but it is believed to be in the late 1800's or early 1900's. The section men were patrolling their section when they found the body of a new born baby on the track. It is believed to have been dropped from one of the night trains passing through. It is not known if there were any efforts made to identify the child or if any authorities were notified. The baby was buried and a fence placed around the little grave. The section men who worked on this section over the years kept the fence in good repair, and painted it white to mark the spot. A small cemetery is located on the grounds of the old Union Church on the east side of the Village. A storekeeper by the name of James Brunnel and a Mrs Stewart were buried there. The Rockland Cemetery was established in 1899. The first person to be buried in the Protestant section was Barbara Edlora (LaKing) Glew, born at Sugar Brook, York County, N.B., June 21, 1872. She was married on July 23, 1889, to Robert Glew, and died at the age of 27 years in 1899.